We’re getting paid for all the work we DIDN’T do. The vine (or two or three… I can’t tell how many are there) that popped up in our compost heap has been producing like mad. Seriously. These pumpkins are like a microcosm of God’s grace. We did nothing to receive them… and they’re overflowing in abundance. Thus far I’ve totaled up 100lbs of pumpkin and there are probably 5 or more fruit still forming out there. Meanwhile, the vines I planted on purpose have mostly died ignominious deaths thanks to boring insects. 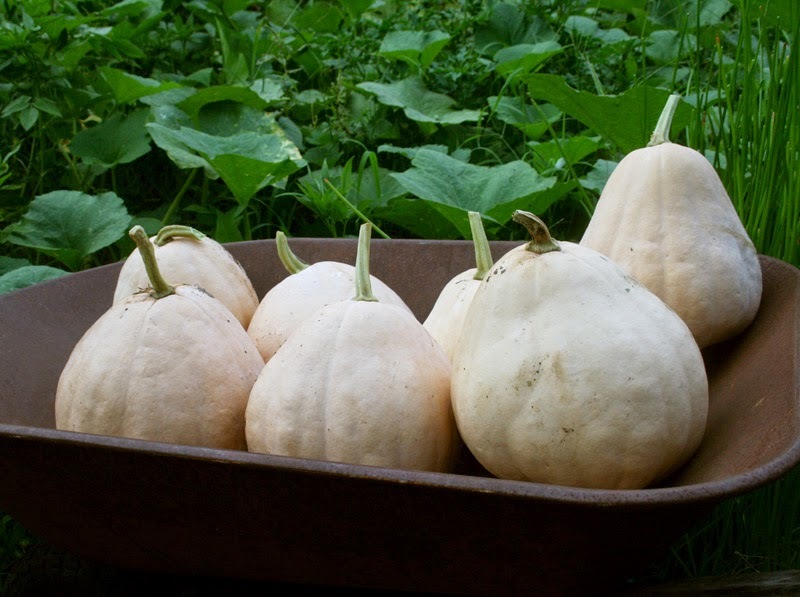 So – what ARE these pumpkins? They’re definitely Seminole pumpkins. We threw seeds in the compost last fall and they’ve plunged right through the summer without a hint of powdery mildew, shrugging off the heat, and going nuts. They also taste very good, much like a butternut with a little lighter flesh. It’s exciting to have success, even when undeserved. These will soon be Seminole pumpkin soup! Rachel created a delicious soup and brought it to church yesterday. The kids love it too, which is an extra bonus. Puree cooked pumpkin, then add to pot with chicken stock. Bring to a simmer. Turn off the heat. Use an immersion blender for a really smooth texture (optional). Add cream and nutmeg. Salt to taste. I do the same thing. Sometimes I'll subtract the nutmeg and add curry powder to taste. Can add some fish sauce too if desired.